If today's back-of-the-box text seems even more vague and unhelpful than usual, there's a reason for that: this figure is only available in a three-pack, not alone. 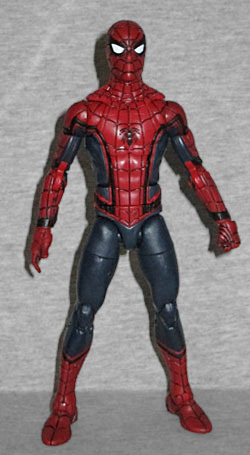 So if you want the new Spidey, we hope you enjoy buying repaints! Have you noticed that Civil War and Batman v. Superman are the same movie, just done with differing levels of skill? They both feature two heroes - a superpowered one in blue and red vs. a plain human one with too much time and money - fighting each other thanks to the machinations of a villain, they both serve as the basis for a new team spinoff and a new solo film starring royalty (Princess Diana and King T'Challa), and they both had the secondary goal of introducing a new actor into a legacy role and getting audiences to accept him; for BvS it was Ben Affleck as Batman, and for Civil War it was Tom Holland as Spider-Man. This figure is, head to toe, an entirely new sculpt. There is nothing about it that's reused from any previous Spider-Men, but really, there isn't much that could be. The head, maybe? The thighs? Anything with too many specific costume details would have to be made from scratch, so at that point they might as well go all out, right? The new costume does what the Marvel Cinematic Universe does best: it draws heavily from the comics, but gives it a tweak so we're not just looking at a goof in spandex. In other words, this is a lot more Tobey Maguire than Andrew Garfield, which is a good thing. No stupid swirling colored stripes, no basketball texture, no silver sneaker soles, just the red-and-blue costume you know from the comics. Ahhh, success! But so that we know this is Earth-199999 and not Earth-616, there have been some minor changes. While the pattern of the red and blue is (mostly) the same as you know from the comics, there are black panels tracing the edges. For the most part, it looks pretty good, but the fact that the line goes all the way down the inside of the arm to connect to the external webshooters is a little weird. 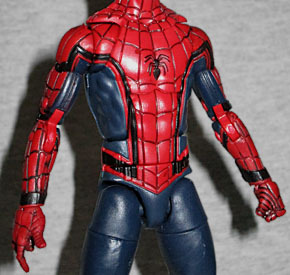 His webs are sculpted in, which is just a feature of this toy, not the actual suit: on the real thing, the webs appear to just be black stitching. The emblem on his back is raised, but the one on his chest is a different design than was seen in the film. It must have changed during production. The articulation is outstanding. 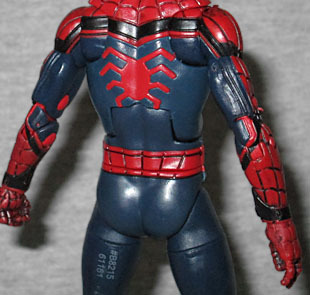 Spidey has a swivel head, hinged neck, hinged pecs, swivel/hinge shoulders, swivel biceps, double-hinged elbows, swivel/hinge wrists, hinged torso, swivel waist, balljointed hips, swivel thighs, double-hinged knees, and swivel/hinge rocker ankles. This is a one-time-use store exclusive figure with a completely new sculpt and no corners cut in the articulation? 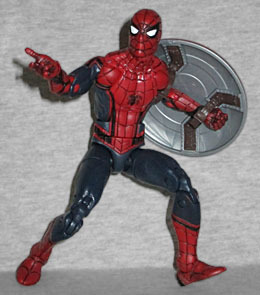 It certainly adds credence to our belief that Hasbro will be reusing this mold when Spider-Man: Homecoming comes out. The figure doesn't break the 5⅞" mark, because this Spidey is still a teenager. The accessories are kind of overdone; you spend the money to get Spider-Man, and he comes with with "battle damaged" versions of Iron Man and Captain America! No wonder this figure is so expensive! They're both the same molds as the standard releases, just given halfassed "dirty" paint apps to make them look beat up. Iron Man at least should have some remolding, to show the abuse his armor took, and Cap should be bloodied up (though that might have been hard to sell to Walmart). In Cap's case, the battle damaged paint is a little bit welcome: remember, the standard figure was just a repaint, so dirtying it up helps set this one apart a little more. That's good. It also comes with the unmasked head that looks nothing like Chris Evans. That's not as good. The important thing is that his shield is similarly sooty and painted with silver scratches, so it really looks different! 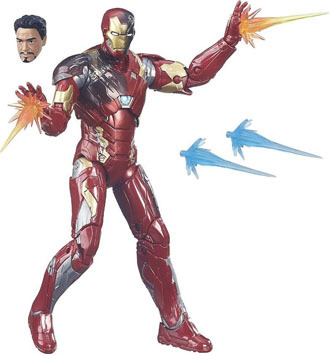 Iron Man comes with a new Tony head (which actually looks like RDJ, so that goes in the win column) as well as two additional blast effects done in orange so you can fill his feet and his hands at the same time. Spider-Man? Good. Captain America and Iron Man's accessories? Good. Having to buy Captain America and Iron Man to get Spider-Man and said accessories? Bad. We already had to buy the figures once, to build Giant-Man, and now we have to buy more of them? Not cool, Hasbro. There had to be better options, especially with Hawkeye and Vision still in need of toys. Sure, they were probably going for a thematic thing, but Spidey's split between #TeamEdward and #TeamJacob didn't happen in the movie the way it did in the comics. This set was announced as a "shared exclusive," but when it's available at HasbroToyShop, Entertainment Earth, BBTS, Amazon, Target, Walmart, Toys Я Us, and every single comicshop in America via Previews, then what exactly is making it exclusive? At what point does it stop being "exclusive" and just become "a thing you can buy"? 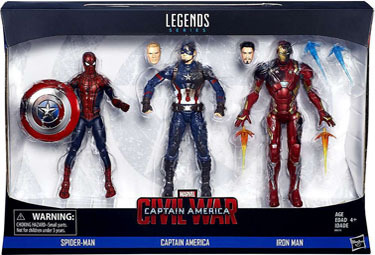 Hell, the actual Civil War toys are harder to get than this set. Spider-Man is nice, but you might be better off hoping for clearance or just waiting until he gets his own movie.